The small package of resistance, the resistor is used in so many circuits, in so many forms, that it is almost an omnipresent electric component. From the very basic fixed resistors, where the resistance remains unchanged, to different types of variable resistors, whose resistances change according to different factors. The variable resistors are of different types; there are ones in which the effective length of the resistive strip plays role in changing the resistors like the potentiometers and rheostats and then there are other set of variable resistors where a manual change in resistance is not possible, rather they are sensitive to physical factors such as temperature, voltage, magnetic field etc. We have already discussed the variable resistor where the resistance can be changed manually (like potentiometer and rheostats) in our previous articles. This article will guide you through the world of a resistor that is dependent on voltage, known as the Varistors. A Varistor is a varying resistor whose resistance depends on the applied voltage. The name has been coined by linguistic blend of words; â€œvaryingâ€ and â€œresistorâ€. They are also known by the name VDR [voltage dependent resistor] and have non-ohmic characteristics. Therefore, they come under non linear type of resistors. Unlike the potentiometers and rheostats, where the resistance changes from a minimum value to a maximum value, here in Varistor the resistance changes automatically with a change in applied voltage. This Varistor has two semiconductor elements, and provides over voltage protection in a circuit, similar to a Zener diode. So how does the change in applied voltage change its resistance? Well, the answer lies in its composition. Since it is made of semiconductor material, its resistance dips as the voltage across it increases. When there is an excessive increase in voltage, the resistance across it decreases manifold. This behaviour makes them a good choice for over-voltage protection in sensitive circuits. A real life Varistor are shown in the above figure. You may confuse them with capacitors. However Varistors and capacitors have nothing more in common than their size and design. A Varistor is used to suppress voltage, whereas a capacitor cannot perform such functions. In its early days, the Varistor was represented as two diodes placed anti-parallel to each other, as shown in figure, due to its diode like behaviour in both directions of current flow. However, now that symbol is used for a DIAC. 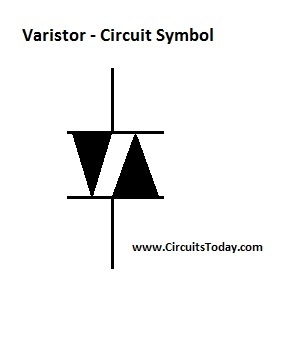 In modern circuits, the symbol for Varistor is shown below. You may wonder on how es a Varistor helps in suppressing the voltage transients in a circuit? To understand this, let us first understand what the source of voltage transient is. The origin of voltage Transient in electrical circuits and sources are regardless of whether they operate from an AC or DC source, since their origin is from the circuit itself or they are transmitted from any external sources. These transients result in an increase in voltage to several thousand volts, which can prove to catastrophic for the circuit. Hence these voltage transients need to be suppressed. The L(di/dt) effect which is caused by the switching of inductive coils, transformer magnetizing currents and other DC motor switching applications, is the most common source of voltage transient. 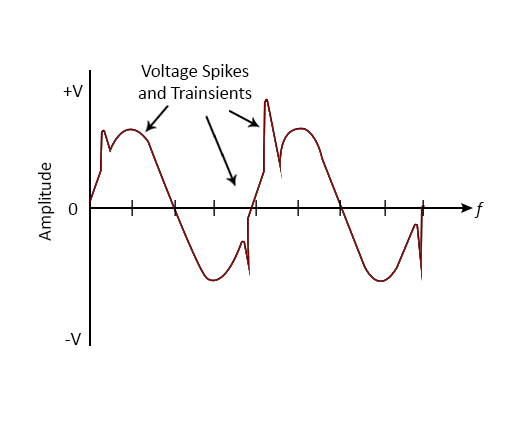 The figure below shows the waveform of an AC transient. In DC circuits: Positive to negative terminal. Now what about the resistance offered by a Varistor? Next section deals with that. The name â€œVaristorâ€ suggests of a device that provides resistance like a potentiometer or a rheostat, however the actual function of a Varistor is completely different from them. First, the change in resistance cannot be done manually like that in a pot or a rheostat. Second, under normal operating voltage, the resistance offered by a Varistor is very high. As this voltage starts increasing abruptly, mostly due to the voltage transients produced in the circuit or induced from an external source, the resistance starts to decrease rapidly. 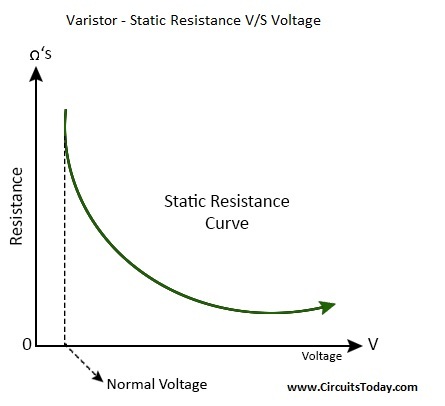 The relation between the static resistance and the voltage across the Varistor is shown in the figure below. In order to explain the working of a Varistor, letâ€™s use its VI characteristic shown in figure below to understand it better. The V-I characteristic curve of Varistor is similar to that of a Zener diode. It is bi-directional in nature, since we see that it operates in both first and third quadrant. This feature makes it suitable to connect it in a circuit with either AC or DC source. For an AC source it is apt since it can function in either directions or polarities of a sine wave. The clamping voltage or the Varistor voltage shown in the figure is defined as the voltage up to which the current through the Varistor is very low, mostly of the order of few milli-amperes. This current is commonly called the leakage current. This value of leakage current is due to the high resistance of the Varistor, when the clamping voltage is applied across the Varistor. Now looking into the VI characteristic, we see that as the voltage across the Varistor increases above the clamping voltage, there is an abrupt increase in current. This happens due to the sudden decrease in resistance resulting from a phenomenon called the avalanche breakdown, where above a threshold voltage (in this case the clamping voltage) the electrons start flowing rapidly thereby decreasing the resistance and increasing the current through the Varistor. This helps during voltage transients, as when the circuit experiences a high transient voltage, the voltage across the Varistor increases, to a value greater than its rated (clamping) voltage, which in turn increases the current and acts as conductor. Another feature of the Varistor that can be seen from the VI characteristics is that , even when there is an increase in current, the voltage across it remains almost equal to the clamping voltage. This means it acts like a self-regulator even at the event of a voltage transient, making it more suitable for the same, as it keeps the voltage increase in check, during such an event. The steep non linear curve indicates that excessive currents can pass through the Varistor over very narrow range of voltage( indicating its self regulatory property) and clip off any spike in voltage. As discussed in previous sections, the insulating state of the Varistor means that the voltage applied across it is equal to or less than the clamping voltage. A Varistor, in its non-conducting state or the insulating state, acts more like a capacitor than a resistor. Since the semiconductor body of the Varistor acts like an insulator during its insulating state, it can be regarded as the dielectric material, while the two terminals can be regarded as the two electrodes. So this means that any Varistor in its non conducting state will have a capacitance, which is proportional to the area of the semiconductor body and inversely proportional to the thickness of the same. However as the Varistor experiences a hike in voltage across it, it loses its insulating property and starts conducting. In this case, it no longer possesses a capacitance. So coming back to the capacitor behaviour of the Varistor, one main question comes to oneâ€™s mind. Does it behave in the same manner for AC and DC circuits? Answer to this question lies in the frequency of these circuits. As we know that in a DC circuit, there is no role for frequency. Hence, the capacitance remains till the voltage is equal to or less than the rated voltage. In AC circuits though, the case is different. Here frequency plays an important role. Thus, in its non conductive region, the capacitance of the Varistor affects its resistance. Since these Varistors are normally connected parallel to the electronic device to be protected, the leakage resistance drops with an increase in frequency. The resulting parallel resitance and the frequency have a linear relationship. Where f= frequency of the circuit, C=capacitance. Thus, in these circuits the leakage current increases with an increase in frequency. Now letâ€™s discuss the important types of Varistors in brief. The type of Varistors depends on the material type of its body. The two most common types of Varistors have been discussed below. Silicon Carbide Varistor: As can be guessed from the name itself, the body of the Varistor is made from Silicon Carbide (SiC). It was extensively used once upon a time, before the new MOV came to the market. Now they are used intensively in high power, high voltage applications. However, they draw a significant standby current and this is the major drawback of this type of Varistor. Due to this, a series gap is required to limit the stand-by power consumption. 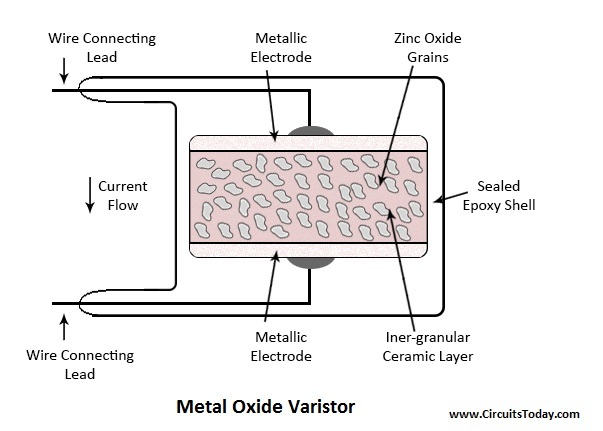 Metal oxide Varistors (MOV): Since SiC Varistors had some serious drawbacks, another type of Varistors the metal oxide Varistors were developed. It provides very good voltage transient protection and is now quite popular. Here the body is made of a metal oxide, mostly Zinc Oxide grains. These are pressed as a ceramic mass, with 90 % of Zinc Oxide grains and 10 % of other metal oxides like cobalt, bismuth and manganese. This is then sandwiched between the two metal plates. The 10% of metal oxides of cobalt bismuth and manganese act as a binding agent to zinc oxide grains so that it is kept intact in between the two metal plates. The connecting terminals or the leads are connected to the two metal plates. Figure below shows the inner structure of MOV. The major advantage of MOV over Silicon Carbide Varistor is its low leakage current. MOV has a very low leakage current at normal operating conditions. Also MOV has a very high levels of non linear current voltage characteristics. One disadvantage of this type is that, the surge current depends on the width of transient pulse and number of pulse repetitions. Thus for a transient pulse with a high pulse width, the surge current will rise and may cause heating issues. However this heating can be avoided by dissipating the energy that is absorbed from the transient pulse. 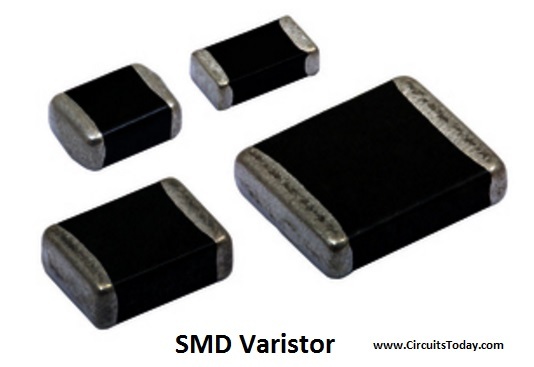 Another important type of Varistor is present in the market, known as SMD or surface mount device Varistor. Let us discuss them in the next section. They are like all other Varistors, mostly used in protective circuits. The body can be either metal oxide or silicon carbide. 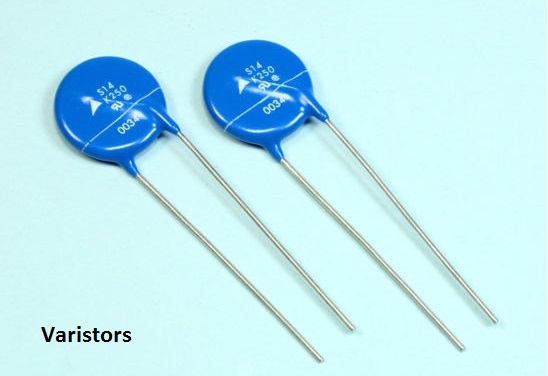 The main difference between these Varistors and the traditional Varistors is that it is small in size and is built using the surface mount technology. This means these devices can be easily connected into a PCB, since their leads are smaller in size or they have pins soldered to pads on the surface of the board, eliminating the need of holes in the PCB. The term â€œVaristorsâ€ is an amalgamation of the two terms varying and resistors. Although the name suggests that this device would work like a potentiometer or a rheostat, its working is completely different. Here the resistance changes with respect to the voltage. The main application of the Varistor is in protecting the circuits against voltage transient. The semiconductor body of the Varistors aids in the same. 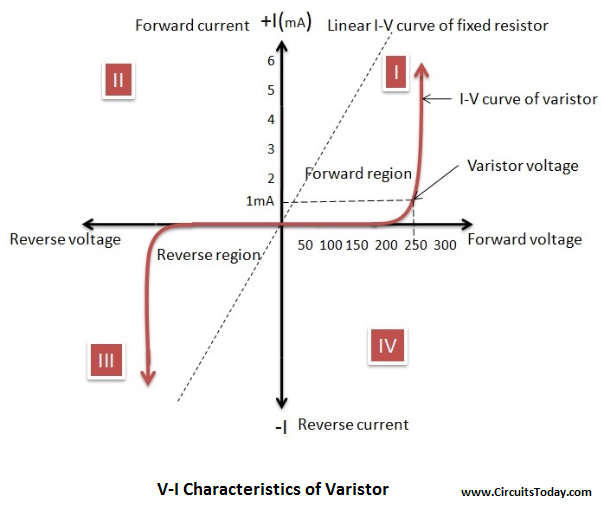 Like a zener diode, Varistorâ€™s VI characteristic curve shows a surge in current after a particular threshold voltage. This threshold voltage is called the rated voltage or the clamping voltage. When the voltage applied across the Varistor is well below or equal to the clamping voltage, Varistor has high resistance and hence is said to be in its insulating state. However, as this voltage increases beyond the clamping voltage, the resistance dips as a result of the avalanche breakdown in the semiconductor body.Â In this case the Varistor is said to be in its conducting state. There are two main types of Varistors available in market namely the silicon carbide and metal oxide Varistors. The Silicon carbide was gradually replaced by Metal oxide Varistors as the former had a considerably high amount of leakage current. Varistors are also available in Surface mount device that helps them to be easily fabricated in PCB circuits. Good informative article. It looks exactly like a capacitor. Include some application too. The symbol of the varistor “circuitstoday” shows, has much resemblance to the symbol of the DIAC, and in my opinion does not give a correct view. You must be referring to the traditional symbol. The modern symbol used for Varistors are given right below by the name “Varistor – Standard symbol”. The traditional symbol is now used commonly for DIAC. It indicates the diode like characteristic in both directions of current flow.